← Stop Buying Technology…The Wrong Way! Cloud computing is definitely the next wave of information technology, and it’s affecting companies, governments and individuals alike. It has taken a while for people to understand the size, scope and potential of cloud technology, and it’s time to stop underestimating it. 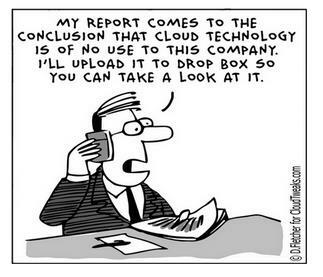 The cloud has a bright future! Again, Sommer Figone has done it again. Here is a repost from his posting on the Rapidscale Blog. I could not have stated it better, clearer or as well as he has. Kudos! Though the true beginning of cloud computing dates back decades, the technology didn’t become a hot topic until about a decade ago. And though it was a hot topic, it wasn’t always discussed with positivity. There were constant arguments about what “cloud computing” truly meant (some of these arguments persist today) and a population who believed it was just another buzzword or fad. Some thought it was interchangeable with Software as a Service, and many were rightfully fearful of cloud data security, which wasn’t nearly as developed as it is today. But despite the opposition, big companies were making the move. Suddenly, it seemed like everyone was in the cloud: Google, Amazon, Microsoft, Netflix and many more. Those who rooted for the cloud argued that people might fight the technology now, but in a few years they’d wonder why they waited so long. Cloud computing allowed for greater innovation, bringing us platforms we take for granted today, like Instagram and Dropbox. But even those who made the move, or considered doing so, were clearly not 100% confident. Many only considered a private cloud solution because it made them feel more secure. Since its beginnings, the cloud has come a long way. There has been an increase in acceptance across the board. Even the CIA is on board. It’s no longer seen as a risky new fad – it’s now simply a standard deployment model. While a few struggle with defining cloud computing, it’s now widely understood to be the delivery of computer resources as a service. According to IBM, 67% of CIOs are actively researching cloud computing technologies and how they might help drive business and operational goals. Security remains an obstacle to cloud adoption, but largely due to the perception surrounding it. In fact, 94% of cloud adopters say it produces security benefits, and many studies have concluded that cloud computing is as secure as on-premises solutions. While security used to be the biggest barrier, many adopters are now capitalizing on it, as well as on control. But as this confidence grows, cloud providers will still have to focus on the security topic. With BYOD initiatives being largely implemented into organizations today, security obstacles will continue to arise. Today, focus has switched from private cloud to hybrid cloud, which combines off-site cloud networks with on-site computer hardware. This model allows businesses to receive all the advantages of cloud computing without using up bandwidth and while maintaining a higher level of control. In the past, it was all about a one-size-fits-all offering, but now, businesses have the option to design a customized solution revolving around their specific needs. Additionally, many now realize the cloud computing does not simply refer to Software as a Service, but also includes other services models like Infrastructure as a Service and Platform as a Service. It’s pretty obvious that cloud computing has a bright future. The growth so far has been amazing, and we haven’t even reached the boom yet. Forbes has reported that by 2017, the cloud market could be as big as $235 billion, tripling since 2011. It is predicted that companies of all sizes will achieve new levels of productivity and innovation, and that the cloud computing industry will become a huge source of new jobs. It will also allow us to better address healthcare, education and other social issues. By 2020, there are expected to be 28 billion connected devices – you can bet that those will generate huge amounts of data, and only the cloud will be able to handle and analyze it. Cloud computing will be a home for small businesses, as there are immense opportunities and advantages for SMBs if they deliver their products and services through the cloud. Their operations will be driven by the technology and they will have a greater potential to experience quick business growth. Hybrid cloud will continue to be the first choice for organizations moving to the cloud. Gartner predicts that by 2017, 50% of large enterprises will adopt a hybrid cloud solution. This will also continue to work as the answer to fears about data security in the cloud, allowing businesses to keep sensitive data in-house while still taking advantage of cost efficiencies and scalability. Security will remain a huge focus of cloud computing, as it will always be important to keep consumer and business data absolutely secure. But as cloud development persists, we will surely see more innovative privacy services. Telecommunications and IT professional with over 25 years experience in Business Technology Solutions. Specializing in managed technologies solutions : hosted VoIP, cyber security, help desk, remote monitoring and maintenance, cloud work space and - the works. Founded Prime Telecommunications in 1993 and providing business communications solutions. Cloud Applications- everything from hosted network security, hosted Disaster Recovery, hosted printer management, data centers and colocation solutions for businesses.